Some of the best super 8 projectors where made by. Super 8 projectors. Were made by many companies and came In many different forms. Elmo where a Japanese built 8mm projector. Some super 8 film projectors could also handle standard 8 film. This was normally achieved by pulling the sprockets out and changing them for standard 8 sprockets. The gate of the super 8 projector had to be changed as well. Dedicated super 8 projectors always worked better. Elmo was the Rolls Royce of projectors. The film transport system was a master piece of engineering. The build quality was second to none. EUMIG was an Austrian company producing audio and video equipment. It existed from 1919 until 1982. The name “EUMIG” is an acronym for the “Elektrizitäts und Metallwaren Industrie Gesellschaft,” or, translated, the “Electricity and Metalware Industry Company.” Eumig projectors where very well built and if you can get a good one today you won’t be disappointed. 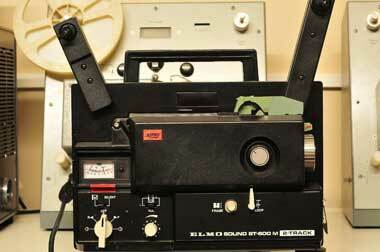 Sound super 8 machines use a tape head built into the machine. These heads read the sound strip 18 frames ahead of the gate. You have just dug out your old super 8 projector from the loft. A word of warning check the projector before you run your precious film through it. Clean the sprockets and gates throughly. Check the belts and clean any fluff and dust from the projector. It is Important to remember that if the film sticks In the gate It will burn in seconds. I can honestly say that is it almost Impossible to recommend anyone or any company for servicing. I am sure that there are good companies or people that can service your projector. I personally have never found one. I tend to service our Elmo super 8 projector myself. If you have any questions about servicing projectors then feel free to give me a call.